For Lamb, in large bowl, blend first 5 ingredients together. Add lamb and mix well; place in refrigerator for 1 hour. Drain and discard marinade; season lamb with salt and pepper. Preheat grill and brown lamb on all sides. Transfer to oven-safe dish and roast in oven at 400°F for about 20 minutes until medium rare (145˚F). Let stand for 10 minutes before slicing thin. For Asparagus Salad, meanwhile, cook asparagus in boiling salted water until tender, about 3 to 5 minutes. Drain and turn into bowl of ice water to chill. Drain, again, and set aside. Cook rice noodles as directed on package. Rinse in ice water; drain and toss with 2 tablespoons peanut oil. Set aside. Measure all ingredients for dressing into jar with tight-fitting lid. Shake to blend well. To serve, divide lettuce leaves among 6 individual serving plates. Divide and spoon a small nest of noodles onto each. 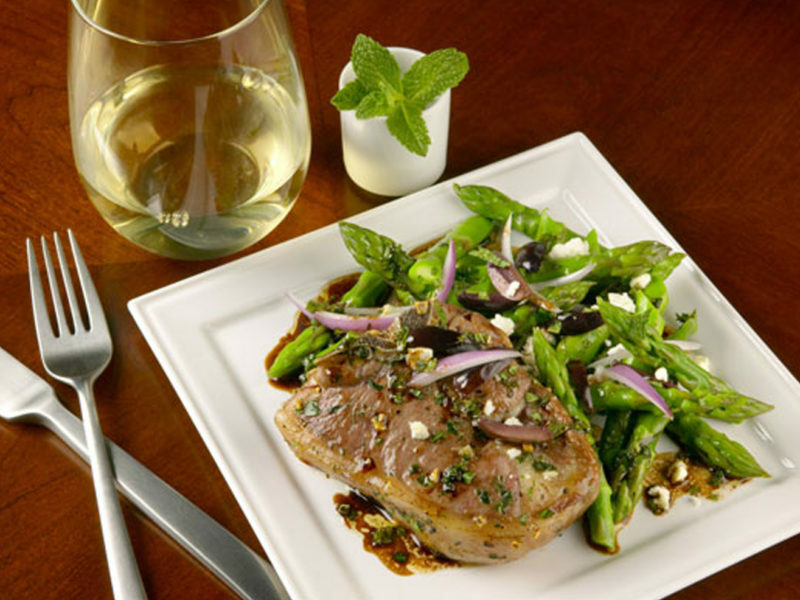 Divide evenly and arrange purple cabbage, red bell pepper, asparagus, and thinly sliced lamb on top of each. Garnish with chopped peanuts and fresh mint. Drizzle with dressing.